This tart may look like a breath of fresh air, like birds chirping outside your window, like the first seedlings of spring shooting their way out of the formerly barren earth. But don’t be fooled by that flaky buttery crust or that sweet tart heavenly center or that luscious almond streusel topping. Anything this good has to come at a price. That’s a cold hard truth. And believe you me when I say that it is laced with deception and duplicity. Yes, I had to lie, cheat, and steal (but just a little) in order to get it to you. And I would do it again. In a heartbeat. It all started on Sunday when I went to Whole Foods in search of the pretty-in-pink stalk that we all know, love and are minorly obsessed with. Fiddlehead ferns, ramps, and all manner of strange tropical fruits from Asia and South America were in abundance. But rhubarb? I looked in every nook, cranny and left not a single passionfruit unturned. To no avail. I am reticent to place blame, but I must say that everything that follows is a direct result of this lack of foresight on Whole Foods’ part. They would have never put up with the hijinks and shenanigans that follow. Just saying. So what is a girl in search of one very particular rhizome to do, other than to try her luck at the local supermarket? I’ll admit, my hopes were not high given that avocados are considered a rare and exotic fruit in this particular chain and as such are stocked only on the rarest of occasions (the third Tuesday of every month that coincides with a full moon, or something like that). (I swear, sometimes I wonder if I really live on the Upper East Side of Manhattan and not in some po’dunk town in middle-of-nowhere America). But I walked into the produce section and there it was, in all of its crimson glory. Hallelujah. So I did what any normal food blogger would do, which is stuff every last stalk into my cart with no consideration for a single other customer and their potential rhubarb needs. And went to pay. She types it in, and up on the monitor it says. Swiss Chard @ 1.99/pound. And really, this is the moment of truth, people. The moment that decided whether I am an ethically sound individual or whether I am morally bereft and void of any values at all whatsoever. I think you know what happened. I eyed the customers behind me in line. They didn’t seem to notice or care (or they had no idea what rhubarb or swiss chard were either). I eyed the cashier. She looked completely content with herself. And you have been forewarned. This tart and the promise of all the delicious happiness that it will bring into your life may force you into compromising situations and may lead you to do completely uncharacteristic things. Just do them. We can make better, more honorable decisions tomorrow. But today? Trust me. It’s worth it. For the crust, blend the flour, sugar, salt and butter in a food processor or in a stand mixer fitted with a paddle attachment until butter is the size of peas. Whisk the egg yolks in an 1/4 cup measuring cup and then add enough cold water to make it 1/4 cup. Add to the flour mixture. Mix until the dough just starts to come together, adding cold water a tbsp at a time, if necessary. Gather the dough, shape it into a disc, cover in plastic wrap and chill in the fridge for at least 1 hour or up to 3 days. To make the streusel, combine the butter, almond paste, sugar, flour, and cinnamon in a food processor and process until the mixture is in fine crumbles. Refrigerate until needed. Allow the dough to stand at room temperature for 5 minutes. Roll on a lightly floured surface into a 1/2-inch-thick disc, rotating the dough frequently to avoid sticking. Transfer to a 9-inch tart pan with a removable bottom. Ease the dough into the pan, fitting it to the pan’s contours with your fingertips. Trim the edges by rolling the pin over the rim and discarding (eating) the trimmings. Freeze until the shell is firm, about 30 minutes. To make the rhubarb filling, combine the rhubarb, brown sugar, and ground cinnamon in a large saucepan. Cook over medium heat, stirring frequently, until the rhubarb is fall-apart tender, about 10 minutes. Fill the tart shell with the rhubarb mixture. Sprinkle on the streusel and transfer to a parchment paper-lined baking sheet. Bake until the streusel is golden brown and the filling is bubbly, about 45 minutes. Transfer to a wire rack and let cool completely. 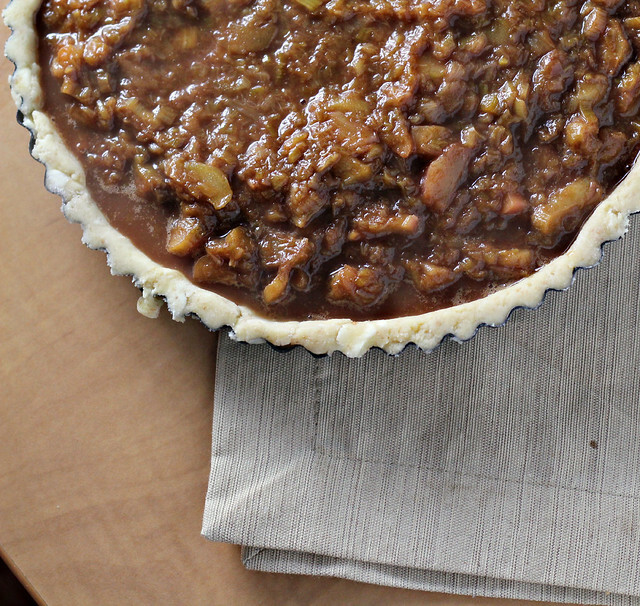 Use a small knife to gently loosen the crust from the tart pan. Push up pan from bottom to release tart. I absolutely adore rhubarb! One of my favs. I’d like this tart to be right in front of me now and not on my computer screen. 🙁 And your checkout story is hilarious. There’s a good chance I would have done the same thing you did… The store really needs to educate their staff better about fruits and veggies, apparently! Tart looks fantastic by the way. I’m sure there are just as many times when it goes they other way and you end up getting overcharged. It all evens out in the end. I’ve got a big bunch of rhubarb waiting for me at home and I’m trying to decide what to do with it this weekend – this tart is really calling my name! That’s a great looking tart! I get not knowing what it is, but even after knowing they get it wrong, LOL! LOL! This has happened to me when buying poblanos; she charged me for jalapenos even after I told her what they were 3 times…The tart looks amazing – pinning. I also had a pretty hard time finding rhubarb but luckily my Whole Foods had it. 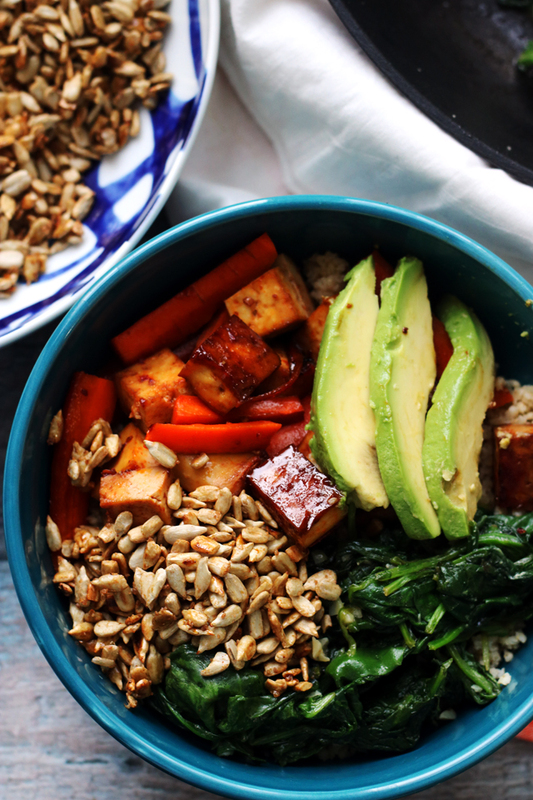 This looks absolutely amazing and droolworthy… I wouldn’t stand a chance! I always love your stories. When I was visiting my niece in New York last year, we had no luck with avocados either. The ones on the produce cart on the street were too ripe. Hey, is it really stealing if the cashier is stupid? I think not. Rhubarb is hard to find at my local market, too. And also? They never ever seem to know what lemongrass is when I buy it. Maybe someday they’ll enter the wrong code for that! I could use a deal. You are so funny! I would of done the same thing! What does rhubarb taste like? I have never had it? Your tart looks delish by the way!! Have a great weekend, hope you get more great deals! You have convinced me. And I can do this with so much more ease. Simply step outside my door and clip the rhubarb! I’VE NEVER TRIED RHUBARB! Ever. Can you believe it? I am not a true foodie. I am ashamed. I need to tangle with this strange celery sister methinks. And soon. HAHAHAHA, I tottaaaallllyyy do that, too. Or when I buy something organic and they don’t ring it up as organic. OOPS! Sorry for ya…yay for me! 🙂 This look amazing, Joanne. LOVE rhubarb. All I can say is, SCORE! I won’t judge you because I would have totally done the same exact thing. What if rhubarb was not in their codes? Then you would have gone home without and then wouldn’t have made this. That would be worse, right? This looks great – We’ve all done that at checkout – besides good for you produce should be reasonably priced anyway. I also have never tried rhubarb–I think that’s a crime that (as an occasional food blogger) could land me in real trouble with the law. Ah yes, ignorance is bliss. Especially for the not-so-ignorant in this case ;). You know, I probably would have done the same thing. Oh, and this rhubarb tart? 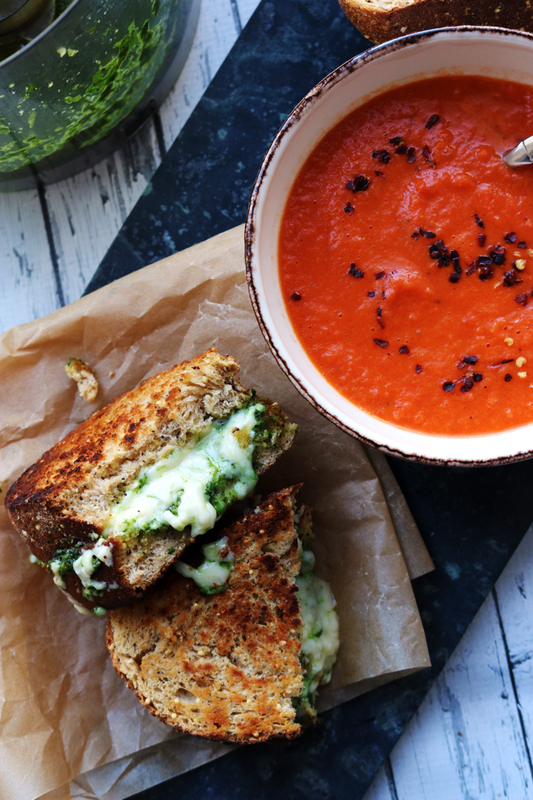 Commence cheek tingling – YUM! The rhubarb certainly looks happy to have been able to come home with you for dessert- it probably was neglected among all those poor, poor cashiers who had no idea what a gem you were skulking away with! Score! Here I was just thinking it was expensive here in Florida…maybe that’s all I need is a clueless cashire. 🙂 (Just think of all the times that you’ve overpaid for something) I have always loved rhubarb, but as a kid I was about the only one in the family that did. 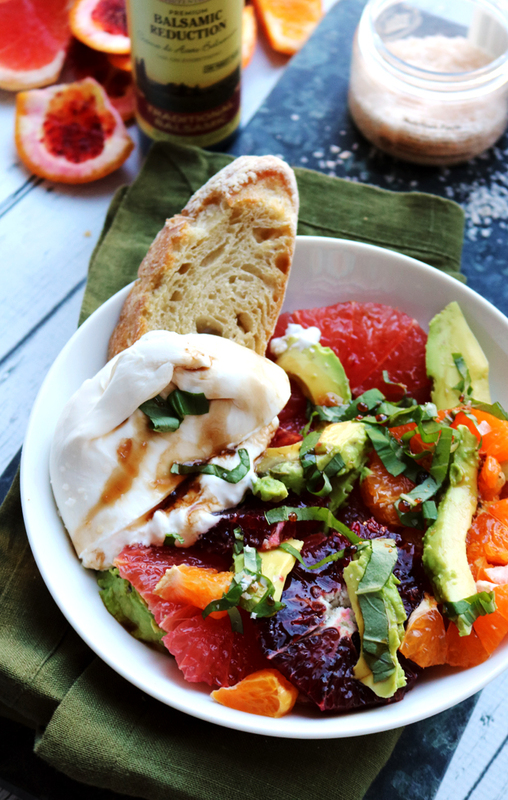 Our neighbor would give us some each spring, it was always the first thing up in his garden…I would gobble this up! You are such a REBEL!! 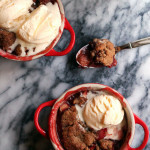 You make me want to try my hand at baking rhubarb. This baby looks AMAZING. hahaha, you crack me up! I actually imagined you found a garden with rhubarb growing in it and snuck up and stole some! I don’t know if you remember the Cooking Photographer, but she once stole cherries from a neighbor’s tree for some financiers she made. You guys are a riot! Desperate times call for desperate measures-haha. The tart looks marvelous and totally worth the slight dishonesty. that looks DELICIOUS! i love rhubarb, but have somehow managed to not pick up any this year – that definitely needs to change! Oh, you’re going to burn in hell but it would be worth it for this pie! 🙂 I wouldn’t have said anything either. What a rebel! Though I’m sure I would have done the same thing. This looks incredible. I haven’t gotten my hands on any rhubarb yet this year, but I will have to very soon! love this history Joanne! and love your tart look amaxing!! LOL! You caught a sale! 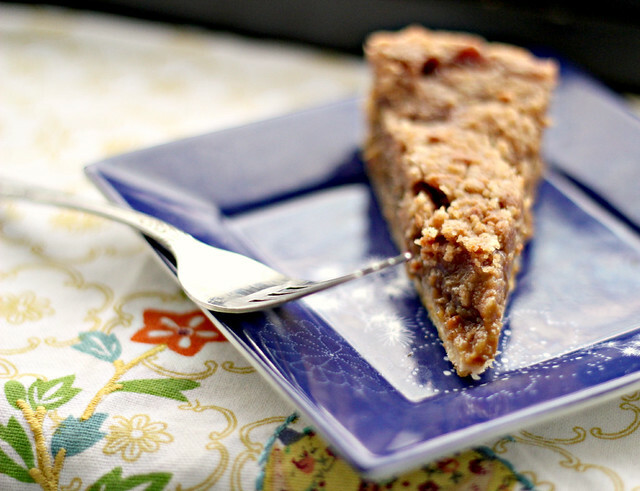 Your tart looks fabulous…I love rhubarb and have some almost ready to pick in my garden right now…maybe this tart is in my future! Well,around here rhubarb is considered an exotic and rare item. Hard to source. But, luckily guavas will work in your little tart. You could have gone for truth at all costs, sarcasm, or a moment of comedy, but consideration for those behind you was very noble. Rhubarb is pretty rare here too! Usually if you see it there’s just a few lonely stalks. This looks insanely good! I love the almond paste topping. Holy crap that looks good! Haha I loved your story (don’t worry I might have done the same thing…) and you are cute feeling a bit guilty but we all take advantage of this beautiful tart! If this was two years ago I wouldn’t know what rhubarb was, too! Mouthwatering!! 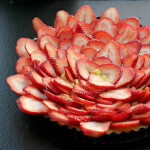 I love the look of this tart, and we grow our own rhubarb, so really there’s no excuse not to make it, is there? I’m a little “meh” on rhubarb. I don’t dislike it, but I’m not wild about it. Until now. You had me at almond paste. Then cinnamon. I’m lusting for it, now. 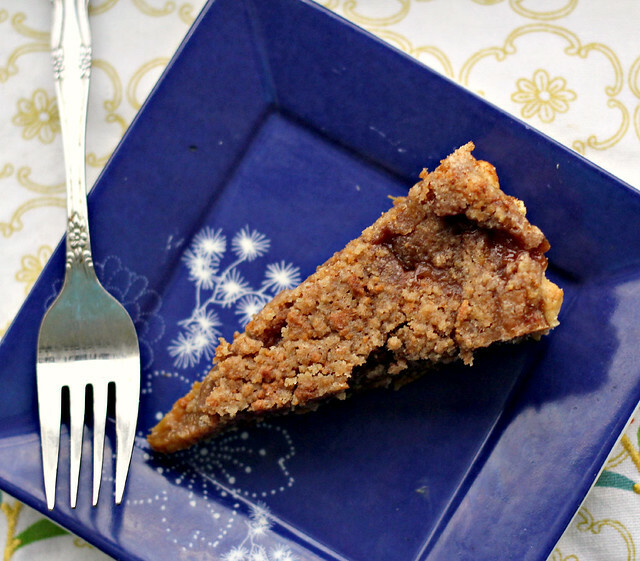 I came home with a big bunch of rhubarb yesterday (that I had to pay full price for) and I was going to do something with strawberries but this streusel tart looks SO good! Very, very hard to find. Finally found some coming in via the Produce Guy! Bought 9 stalks and will be chopping and freezing them since they do well in that state. Then will have “heaven” any time in the next year!! Yay! This sounds, and looks, so good…the cinnamony, brown-sugary filling. Oh man, I def have to make this. The tart looks and sounds delicious and oh so low cal. If the store doesn’t have a system in place to properly charge your purchase, it’s their own d*&% fault and you shouldn’t feel the least bit guilty. This is freakin’ hilarious. Don’t feel guilty! I don’t feel the least bit guilty when I buy a jalapeno pepper that’s so light it doesn’t even register on the scale. Not that I do that on purpose or anything. Or purposely use the self-check out for that reason or anything. 😉 This tart looks awesome. I always want to do something with rhubarb each spring, but for some reason I never do. That changes now. Thanks! I’m laughing out loud right now. I may or may not have done the same thing ;). Your swiss chard tart looks heavenly! Rhubarb! Yum! I find it early spring (hothouse rhubarb and bright red) and now there isn’t much to be found for another few weeks. Then we’ll get some more in, NOT hothouse and not nearly as red. Oh well. It’s still rhubarb. I froze a ton, though, ’cause you know how I love it! Great recipe, Joanne! You makes my mouth water. It looks like a great recipe, different from any other tart recipes. It really looks delicious. Oh my….dessert perfection. This one make it hard to give up dairy. 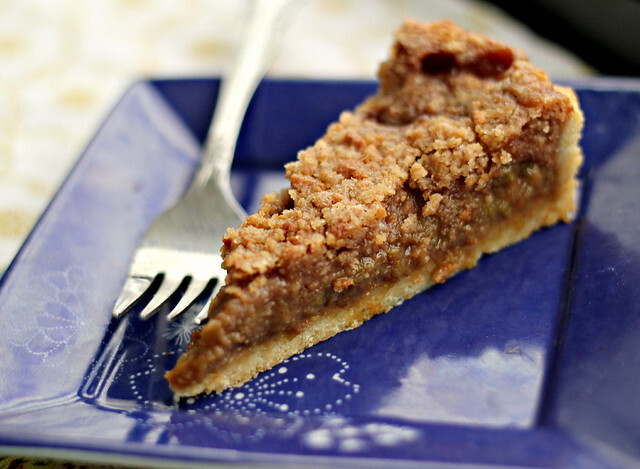 Looks delicious – I make something similar to this and never thought to put almond in the crust. Yum! i love that this is pretty much all streusel with a little bit of rhubarb thrown in. very nice! Haha, love it! And your tart looks fantastic, especially that filling 😀 I love rhubarb – can’t wait for the season to really start here, it’s just barely starting now. I am embarrassed to admit that I have never had rhubarb. When I visited my Grandma in VA a few years ago she had some growing on her property and I thought it was just some discolored celery or something. That’s not to say that Marie Callendar’s in California don’t have rhubarb pie, just, I always go with chocolate cream or cherry or something haha. 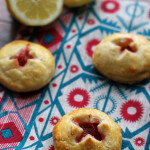 These photos really make me want to try rhubarb though! I know I would have done the same thing. In this economy $2.00 is $2.00. I’m just still shocked that the cashier had no idea what it was. This tart looks great. 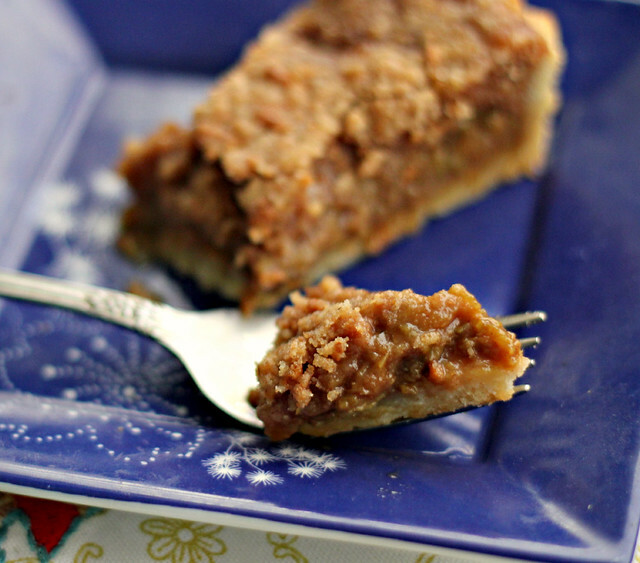 When and if I locate rhubarb, it’s on my list (or may just have to be made with the frozen kind because I need this tart)! I hate it when I go to the store for a certain thing and they are out. And come on, Whole Foods has everything! I go on a huge hunt for that thing and don’t stop until I find it! 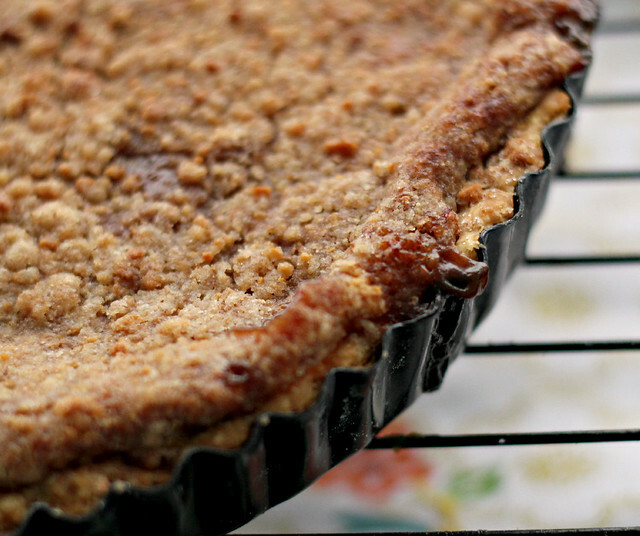 Glad you found the Rhubarb because this tart looks incredible! It’s at this time of year when I miss having my gardens and the 3 types of rhubarb I used to grow. I am sure it is still flourishing!! Great story! I’ve definitely turned a blind eye to incorrect ringing up of produce. Seeing this tart, it was clearly all for a great cause! That looks like the perfect tart! And I do kind of think that if the store doesn’t train its staff to recognise fresh fruit & veg they deserve what is coming to them. Ha, I had pretty much the same experience looking for rhubarb a few weeks ago! I asked if they had any in yet, since it was early in the season, and the produce person looked at me as if I had asked for blue bananas. She couldn’t even understand the word I was uttering; I had to spell it out. Needless to say, the best I could do was a bag of frozen rhubarb chunks that time. Even if I still have to settle for frozen, I really want to make your tart. Love the straight-forward simplicity of it all! This looks great! I just got a big bag of rhubarb from my father-in-law’s garden yesterday. I’m looking forward to cooking with it. Anyway, they found the grits. 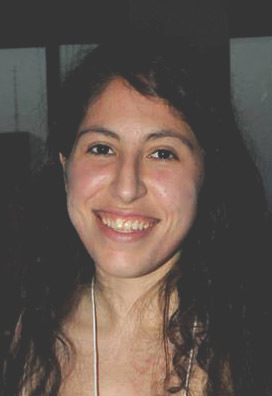 It took three employees and another customer who aided in the search, but they found the grits. You are hilarious! I just love the check-out cashier questions. I have no problem with you compromising your morals to provide this post. 😉 Just go back and buy some Swiss chard next. Maybe she’ll ring it up as rhubarb! This looks amazing. I love rhubarb, but struggle with creativity. Great idea with the tart! What does rhubarb cost by you? It’s really inexpensive by me, even at the farmer’s market you can get a good sized bundle for pretty cheap. I don’t think it’s over $2/lb at the supermarket and all of our local boring regular ones carry it. 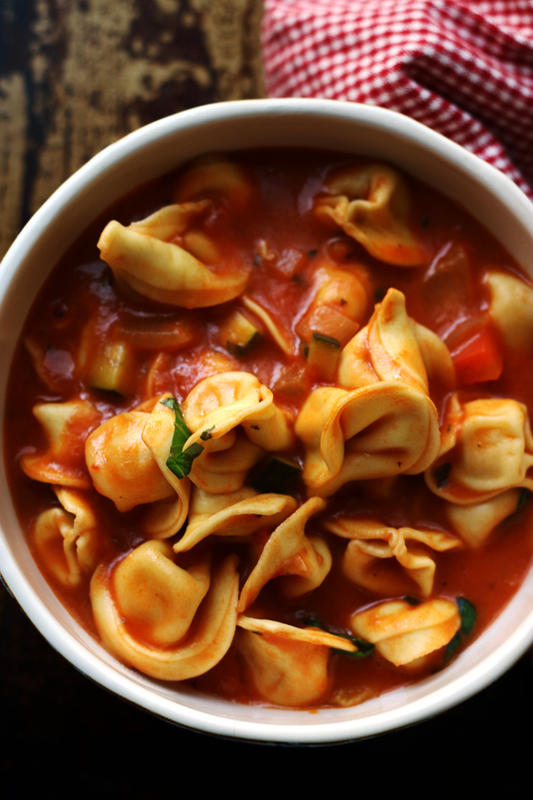 This is a great looking recipe. 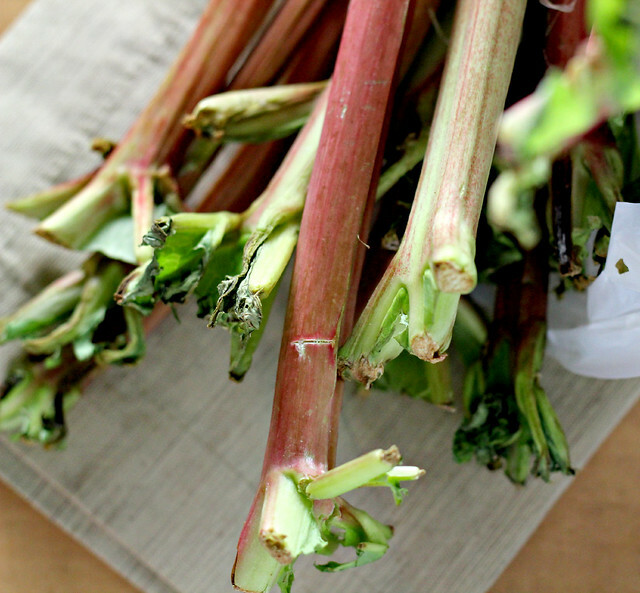 I’ve got to try cooking with rhubarb this spring! I don’t buy a lot of rhubarb, but I do buy a lot of ramps. One time a cashier at whole foods couldn’t find the code for the huge bunch of ramps I was trying to buy, so she just said “here you go” and gave them to me for free. And I didn’t argue. So, don’t feel too bad! It has been years since I have had rhubarb but after seeing this post I am ready to make this recipe. Too funny. I am always having to identify my produce for grocery store clerks. 😉 I say it was a deserved deal and the resulting tart looks fabulous. Wonderful tart. The rhubarb price makes me cringe. Especially when I think of how much of it there is in our garden back home in Germany. I just pick up a batch to make a loaf. I’m excited about all the recipes I’ll get to make and since rhubard is a relatively short season I’ll have to make the most of it! That is hilarious Joanne! I’ve been known to do the same thing but more to rush along the process instead of save a buck. But good for you! 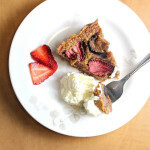 So glad you liked this tart, one of my favorite desserts and I’m not even really a rhubarb fan. Now that is a nice way to enjoy some of springs rhubarb! I just saw the first of the rhubarb at the farmers market this week and I need to pick some up for next week. seriously, the same thing happens to me at the store all the time around here except people ask me “what is this?” when I’m buying cilantro or kale. i love rhubarb – and swiss chard – and this tart looks delicious. Too funny! I’ve actually had that happen so many times, where the cashier has no idea what I even have. I had a girl struggle with beets yesterday. But yeah, this tart totally looks like it was worth it. Delish!